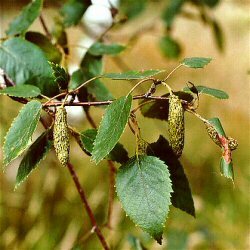 Buy Downy or White Birch Tree (Betula Pubescens) online from UK tree supplier of cell grown broadleaf hedges and shrubs. A native British tree. It is perhaps surprising that Downy Birch or White Birch (Betula pubescens) is a far more common sight than Silver Birch in the British landscape. This as a result of its ability to grow in a wide range of lactions, in particular, it is well-suited to wet hollows and valley bottoms. Identifiable by its leaves, which do not have the long pointed tip of Silver Birch, and darker colour. Another distinguishing feature is the undersides of the leaves are covered in fine (pubescent) fur, hence its name. This tree can hybridise with Silver Birch and as a result it is quite common to find birch woodland where the trees can not be clearly identified as Silver Birch or Downy Birch but as a hyrbrid. Expect a final height of 23m (77ft). Typically, this tree is planted in groups of between 10 and 25 trees. This number of trees is ideal for creating a wildlife habitat and a meaningful source of food and shelter. Spacing may vary between 1m (3ft 4in) and 5m (16ft 8in). The aim is to mimic what nature intended and thus avoid artificial lines. Blending of one species into another is suggested although bearing in mind different growth rates. Downy Birch is a key native tree species and along with the many other native, British tree and shrub species we sell will form part of an attractive native woodland.